Film review by Jason Day of the Tom Cruise starring action thriller Jack Reacher: Never Go Back, directed by Edward Zwick. Jack Reacher (Tom Cruise) is a former Major in the US Army’s Military Police Corp, now working on the outside as a ‘special’ investigating army misconduct. He pays a visit to his old headquarters to see Major Susan Turner (Cobie Smulders), who has been assisting him on a number of his cases. When he arrives, she has been arrested for espionage. Breaking her out of prison, the two must evade counter-forces within the services to find out who has set her up and killed two of her soldiers based overseas. If you like watching people punch, then you’ll love Tom Cruise in the new Jack Reacher. 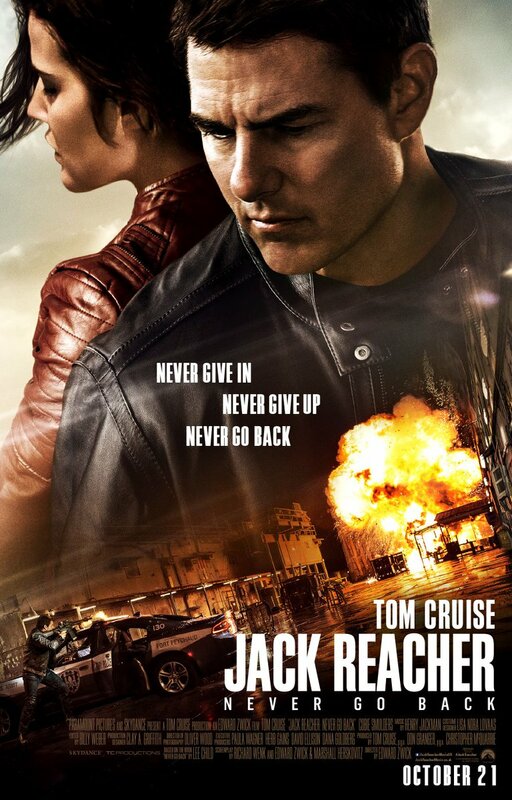 It’s as honest and direct a piece of film marketing you are likely to see as people do indeed punch and get punched in Jack Reacher: Never Go Back. Quite a lot in fact. At my own count, the Cruisemeister himself engages in 12 acts of fisticuffs. In total there are about 20 (I lost count as I fumbled to keep up typing an update in my phone). It’s all too easy to dismiss or satirise Tom Cruise these days, given his highly publicised spiritual leanings, marriages and leaping from sofas, but I’m of the generation that just remembers the phenomenally huge matinee idol he was in Top Gun (1986), Cocktail (1988) etc. but who more than flexed his acting chops in The Colour Of Money (1986), Born On the Fourth Of July (1989) and superbly held his own against Dustin Hoffman’s at times too-studied autistic tics and mutterings in Rain Man (1988). Yes, he is a huge star and has a big industry reliant on his name pulling in big bucks to support it, but surely there’s scope for a few more ‘independent’ films, or even something edgier, such as Magnolia (1999)? But I’m no Hollywood agent, so what do I know? There’s nothing wrong with his performance here, it does what it says on the tin: Utter hard man line. Punch hard man. Be nice to lady and little girl. Utter funny man line. Punch hard man. Trying to evade the standard action formulae inherent throughout the writing is the interestingly named Cobie Smulders (although her real name is Jacoba), confidently playing the sort of uber-cool, straight as an arrow, army hardass. She mentions briefly about the cr*p a woman in the military has to go through, relentlessly, as they rise through the ranks and then just as swiftly moves on from this to get back to the job at hand. So, a professional hardass at all times. I’ve seen more exciting high-octane films than this, but its a fair enough car ride of fun and at least if you stick around for the whole journey, you’ll learn a whole lot about how to attack people with household objects (bannister legs, garden hoses etc) other than your fists. Director: Edward Zwick. 118 minutes. Paramount/Skydance/Huahua film & Culture/Shanghai Film Group/TC Production. (12a). Producers: Tom Cruise, Don Granger, Christopher McQuarrie. Writers: Marshall Herskovitz, Richard Wenk, Edward Zwick. Tom Cruise, Cobie Smulders, Aldis Hodge, Patrick Heusinger, Danika Yarosh, Holt McCallany, Austin Hebert, Robert Catrini, Robert Knepper.